Gayle Bard and Steven Maslach have collaborated on the ceiling treatment of the main axis connecting the library entrance with the atrium stairwell. 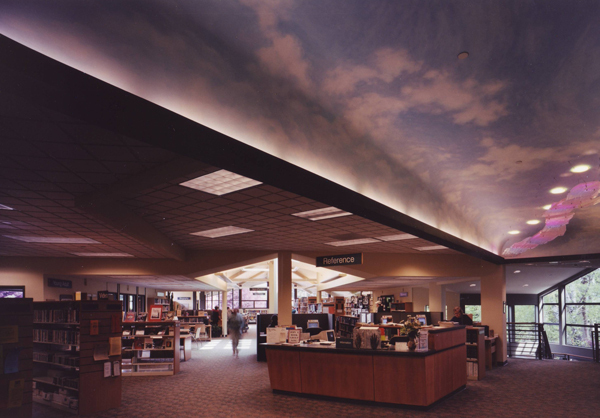 This ceiling is coved at the ceiling/sidewall junction and illuminated from below with concealed fluorescent fixtures; surfaces are painted to emulate sky. The portion of this sculpture which is glass consists of several cast and hot-worked glass panels suspended from the ceililng. The castings are clear glass with textures and flow patterns representative of the flow of water. Dichroic filters impart a blue to magenta delicate colloration to the glass; these colors shift and change as one walks underneath the sculpture.